He knows who I am, but doesn't call out my name. Still, he beams in earnest, and I know he's truly glad to see me. Then Mom raises her voice and says, "Honey, Annie's here!" Sometimes she needs reminding that Dad isn't deaf, he's got Alzheimer's Disease. And so we've gradually come to accept that this man who once laughed and danced, provided and nurtured, managed and mentored, now lives life in his room on the second floor, contentedly existing in this quiet, private world of past memories. I hope they're memories of his grandkids running through the golf greens at dusk, while we parents lounge on the verandah, the Patriarch watching with glee, as he nurses his usual Sweet Vermouth on the Rocks. I hope they're happy memories, that's all. It's the addition of Sweet Vermouth that gives this dish an interesting twist! 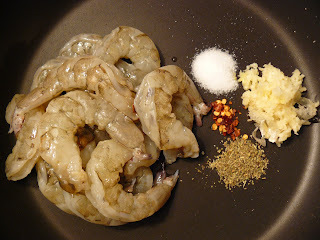 Cook shrimp and garlic in olive oil on medium high heat, add oregano, chili flakes, 1/2 teaspoon salt and 1/4 teaspoon pepper. Mix well and cook for about 2 minutes. Stir in vermouth and tomatoes, scraping up any brown bits from bottom of pan. 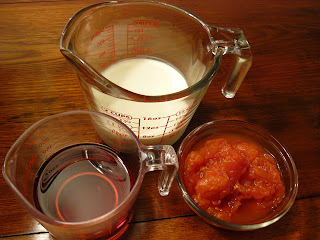 Add cream and briskly simmer until sauce has thickened slightly, about 1 minute. Stir in lemon juice. Meanwhile, cook spaghetti in a pot of salted boiling water until al dente. 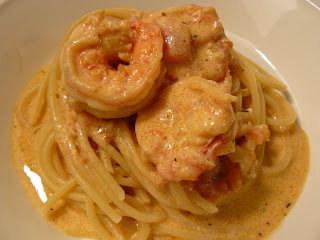 Drain pasta and top with shrimp and sauce to serve. Even I could make this. Lovely writing (and cooking) as always. As Jacque Pepin says, "'appy cooking!" Love this! You should have done this long ago - since you are soo good at it. Am suddenly very hungry from reading your Blog. Anyway - count me among your followers! Nice to hear from you Pia! And see you soon! You don't even know hoe many times I asked my mother to make this! And quite frankly I'm getting annoyed that she is forgetting. The way you took the picture of this meal was unbelievable. You are so good at photography you should become a photographer! You are a GENIUS!! The lighting is prefect, the scene is perfect and of course the meal is perfect! GENIUS!!! -your good friend who is the daughter of the person who inspired you to make long beans and butternut squash in coconut cream. My goodness Ms. Anonymous, thanks for the gushing compliments! Yes, your mother should definitely make this one day. You'll love it.